Here’s what’s up in the world of TV for Wednesday, October 17. All times are Eastern. Suburgatory/American Horror Story (ABC/FX, 9:30/10 p.m.): Here are two shows about people who are transported to weird places and have to confront the horrors therein. The first aims to make you laugh. The second… well, maybe it aims to make you laugh? We watched a whole season of the damn thing, and it ended with a family of ghosts standing around a Christmas tree, so we couldn’t really tell you what the hell it’s trying to do. But it’s certainly something to see! 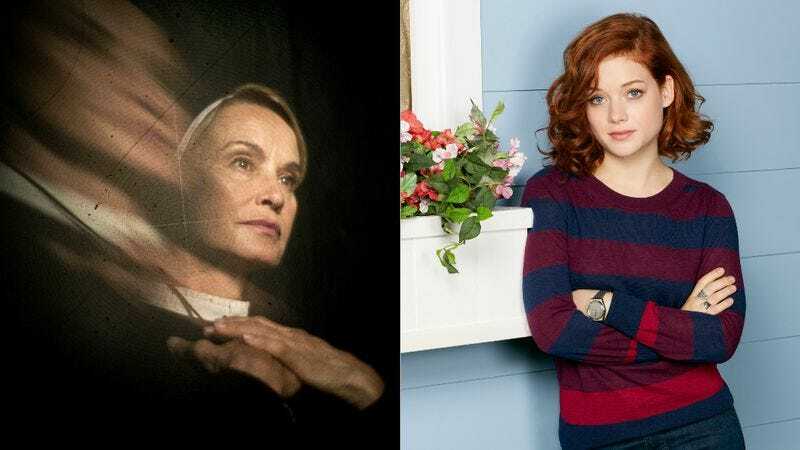 Brandon Nowalk will let you know how Tessa got along with her grandmother, and Todd VanDerWerff checks in to the Asylum. Animal Practice (NBC, 8 p.m.): Our Animal Practice coverage may soon be at an end, if you don’t all rally to save it. And by that, we mean that you should probably post 500 comments in the next review. Margaret Eby and that monkey would thank you. Still won’t stop the show from getting cancelled. Arrow (The CW, 8 p.m.): This week’s red-hot superhero action involves Oliver being asked to take over his father’s company, which is the sort of superheroic adventure that was previously only confined to Shark Tank. Alasdair Wilkins hopes when he grows up, he gets to take over a multinational corporation! The Middle (ABC, 8 p.m.): And here’s another hard-hitting plot, as Rita accuses Frankie of stealing her garden hose, in an episode called “The Hose.” Actually, given this show, that might end up being the funniest episode of the season. Will Harris remembers the time he stole his first garden hose. Survivor (CBS, 8 p.m.): We’re officially to the point where the TV Guide descriptions of the show are at all helpful in crafting jokes about anything other than how vague they are. “A twist in the game leads to a shift in tribal dynamics”? Really, TV Guide? That’s all you’re going to give Carrie Raisler to work with? The Neighbors (ABC, 8:30 p.m.): Somehow, this episode about the alien kids going to school with human children for the first time is entitled “Bathroom Etiquette,” which suggests alien school is very different from human school. Dennis Perkins expects that there will be some general tomfoolery here. Modern Family (ABC, 9 p.m.): You might be wondering how you’ll feel about this episode—which features Cameron returning to music teaching—but Donna Bowman has already seen it through magic, and we’ve already read her review through even greater magic. So we already know. So there. Supernatural (The CW, 9 p.m.): Somebody’s killing people who received donations from the same organ donor, and that can mean only one thing: That person’s corpse has returned from the dead and is collecting his old organs! Phil Dyess-Nugent hopes the real answer is the Axeman of New Orleans. Nashville (ABC, 10 p.m.): A bunch of you watched this last week, which means that it could stick around for a while. This week’s episode involves all the soapy drama of a political background check. Todd VanDerWerff cautions Connie Britton not to release her tax returns. It’s political suicide, Connie! South Park (Comedy Central, 10 p.m.): We always love a good Butters storyline, as any of you who’ve been reading this feature for any length of time will already know, so we’re excited by the thought of him and Kenny taking a trip to Hawaii. Marcus Gilmer hopes they find the four-toed statue there. Key & Peele (Comedy Central, 10:30 p.m.): One of the sketches in this episode involves “a child’s confusing genitalia,” according to the episode summary. Steve Heisler would like you to know that he finds your genitalia confusing. Seriously. The way it does that thing? How do you live like that? Gross! The Sopranos (1 p.m.): After a long, long road, Todd VanDerWerff’s coverage of this seminal drama series has finally reached the last stretch of nine episodes, beginning with the fantastic “Sopranos Home Movies,” which somehow didn’t make his TV Club 10 of the show, because he’s a complete idiot. World Without End (Reelz, 8 p.m.): Another year, another miniseries based on an epic Ken Follett novel about the Middle Ages. We don’t really know what this one’s about, but the first episode description contains references to witchcraft trials and a corrupt monk, so consider our DVRs super-set. The Houstons Remember Whitney (Lifetime, 9 p.m.): We probably could make a joke about this, but that would just make us seem like assholes, and since we’d rather not be perceived as such, we’ll just say that if you, too, are still missing Whitney Houston, here’s a sure-to-be lovely remembrance of her. Osama Bin Laden: The Finish (Discovery, 10 p.m.): On the other hand, we’re doubting this remembrance of somebody who died a short while ago will be all that lovely. Instead, we’re predicting lots of chanting of “USA!” and maybe Joe Biden doing a touchdown dance or something. Classy stuff. Cowboys & Aliens (HBO, 8 p.m.): It’s rare to see America’s great fanboy community largely rejecting something callously calculated to appeal to it, but that very thing happened with the reception of Cowboys & Aliens, which seemed to think nerds just wanted to see geeky nouns fighting each other. MLB Playoff: Game 4: Yankees at Tigers (TBS, 8 p.m.): The Yankees attempt to stave off elimination, with this one last gasp game in Detroit. The Tigers, up 3-0, can close out a trip to the World Series with a win tonight. The Fox executives, longing for Yankees ratings, weep quietly as their beloveds lose. The Men Who Built America (Tuesday): Sadly, this History Channel miniseries does not appear to be a riff on The League Of Extraordinary Gentlemen starring Henry Ford, Andrew Carnegie, and John D. Rockefeller. Les Chappell wishes it had been, because he would have loved to have seen Ford, twirling dual assembly lines, shout, “PREPARE TO BE DISASSEMBLED!” Write your own fanfic below.